This is one of diving’s most exceptional values. 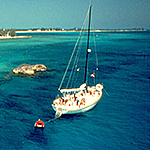 Blackbeard’s Cruises has sailed the Bahamas for over 30 years and carried more divers than any other operation in the Caribbean. Blackbeard’s is an adventure packed, affordable dive vacation with something for everyone. Whether an average Joe or a CEO, the Bahamas itinerary includes the best variety of diving, including walls, wrecks, reefs, drifts, blue holes, night and shark dives. The boat departs from Nassau, a one hour flight from Florida. you live dormitory style in cabins on a 65-foot sailing sloop. Pack light because everything you take on board lives in your bunk with you. Dive equipment sleeps topside in the weather; You sleep below in a bunk all your own. The base price of $1,300 includes meals, beverages/bar, up to four dives a day, sleeping accommodations, use of tanks and weights. Who is This Trip Ideal For? Don’t mind roughing it a bit in order to enjoy one of the best values in diving. Want to get in as many dives as possible during your vacation. Will not be traveling with any nondivers. Are seeking to do little more than just eat, sleep and dive. Want to see sharks and other large critters. The boat departs Nassau Saturday, October 12 2019. We return to Nassau on Friday, October 18, 2019. We will need a copy of your passport at sign up. Your passport must be valid for six months past the date of the trip and have at least two blank pages remaining. 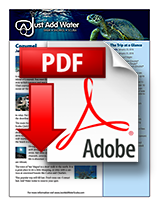 Divers must be able to present a certification card and proof of insurance. Space on Just Add Water group trips is limited and offered on a strictly first-come/first-served basis. You can prevent someone else from getting your spot by signing up as soon as possible. To do so, simply stop by the store or call (440) 942-7575. Divers Alert Network membership can offer a host of benefits, including worldwide recompression chamber insurance your current health coverage most likely does not provide. Low-cost dive travel insurance available, too. More….